Beautiful, high quality AA Selenite 60mm-65mm spheres from Morocco. Selenite grows in long "cat's eye" colorless translucent pearl white crystals or stone rosettes and is a form of Alabaster. It is said to be a powerful cleanser of negative energies, even clearing quartz crystals. 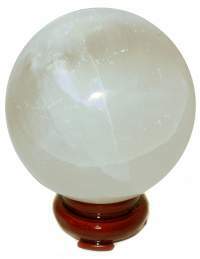 Selenite spheres have the appearance of a full moon and is a natural cat's eye stone as opposed to the man-made fiber optic varieties. The Oriental Rosewood Stand is sold separately. Fabulous and rare Iron Pyrite open geode spheres from Peru, are masterfully polished to expose the natural crystals growing in the stone. Pyrite, well known as fool's gold, is a polymorph of Marcasite. It is said to be a very potent protector, shielding one from intense negative energies. The Oriental Rosewood Stand is sold separately. 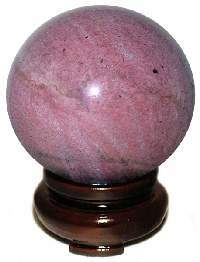 These high polish Peru Rhodonite spheres have the well known pink matrix. They are lightly veined in black with fern like formations of manganese oxide. Rhodonite is said to balance the yin-yang energies and assist in the attainment of one's greatest potential. The Oriental Rosewood Stand is sold separately. These high quality Brazilian Rose Quartz spheres are 65mm or 2 3/4" to 75mm or 3" in diameter with a highly polished smooth finish. 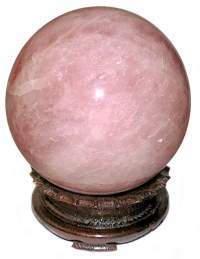 These lovely spheres have a gentle pink hue with semi-translucent qualities. Enjoy the beauty and gentleness of rose quartz, called the Lover's Stone, it can be used to radiate the soothing love energies in your home or office. The Oriental Rosewood Stand is sold separately. A beautiful combination of Fuchsite, Ruby and Blue Kyanite Gem Spheres from India. The Ruby crystals have a wonderful sparkle surrounded by Blue Kyanite in Green Fuchsite. Kyanite does not hold negative energy and assists in cleansing other crystals. Ruby encourages the search of one's Bliss and lights the darkness within the spirit. Fuchsite is said to increase the healing properties and flow of energy from other healing crystals. 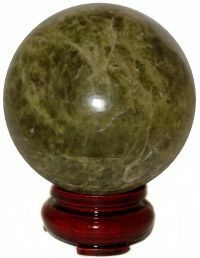 Each 2 1/4" AA quality Ruby Fuchsite sphere is hand cut and polished in India. The Oriental Rosewood Stand is included. This Rutilated Milky Smoky Quartz Sphere has large ribbon-like needles of Black Tourmaline. The Black Tourmaline Rutile is exposed on the surface like geode crystal formations. Tourmaline has historically been a stone of great spiritual value believed to repel and the transmute negative energy. The Oriental Rosewood Stand is sold separately. 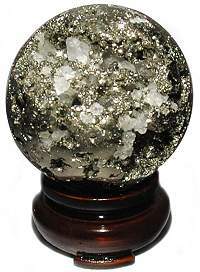 Hard to find Black Tourmaline Rutile Spheres in Snow Quartz matrix from India. Tourmaline has powerful energies both repelling and protecting from negativity. It increases vitality and guards against depression. In crystal lore Snow Quartz also called White quartz, has a smooth, muted energy that is helpful in dissolving the victim mentality as well as processing a particularly difficult learning experience. The Brass Scroll Stand is sold separately. Sunstone is known for it's iridescence and brilliant reflections. 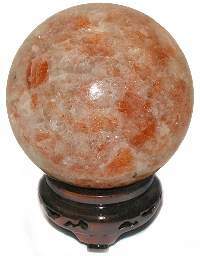 These A quality Sunstone spheres from India shimmer with bright chatoyant orange and cream sparkle. In Crystal Lore Sunstone is used to increase vitality and alleviate stress. It can encourage individuality and bring good luck in games of chance. The Ancient Greeks believed Sunstone represented the sun god and brought life and prosperity to it's possessor. The Large Oriental Wood Stand is sold separately. 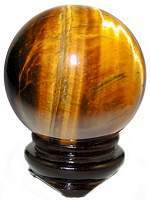 High quality Tiger Eye spheres from South Africa are very hard to find lately. Polished Tiger Eye is a joy to look at with it's rich chatoyancy and deep reflective colors. Tiger Eye exudes assertiveness and drive, it magnifies personal energies of desire, enthusiasm, vigor and action. 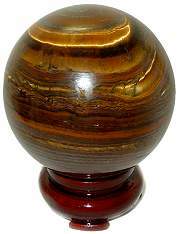 Each highly polished AA quality Tiger Eye gemstone sphere comes with an Oriental Wood Stand. High quality 2 3/8" Black Tourmaline Sphere from India with clear quartz and other luminous gem and mineral deposits. In crystal lore this gemstone has powerful energies both repelling and protecting from negativity. It has been used to increase vitality and guards against depression. The Oriental Rosewood Stand is sold separately. 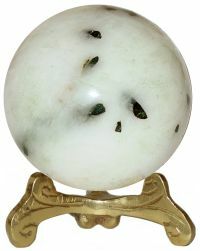 Unusual Green Garnet in 55mm to 65mm spheres from India, this stone is also known as Vasonite. These beautiful spheres have a medium to deep Peridot green color with a high shine and hand polished finish. Garnet, used by Mayans, African Shaman and present day Crystal Masters, is considered a powerful "Sacred Stone", believed to extract negative energies on all levels and warm the heart. The Oriental Wood Stand is included with 55mm size only. Large rare Tiger Eye blended with Tiger Iron beautifully polished 65mm or 2 3/4" gem spheres from South Africa. These high quality Tiger Eye/Iron comprises golden Tiger Eye, Red Jasper and Hematite. It combines the qualities of 3 excellent stones, Tiger Eye invigorates, Hematite clarifies the mind and Red Jasper nurtures and protects. The Oriental Rosewood Stand is sold separately. 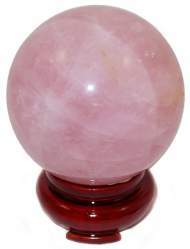 Amazing, huge 6 5/8" diameter superb quality Rose Quartz sphere has an excellent pure pink hue with outstanding polish and finish unusual for such large spheres. 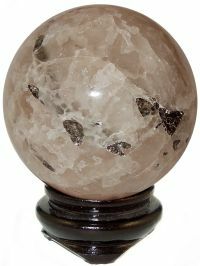 This rare super sized Madagascar Rose Quartz sphere is 165mm or 6 5/8" in diameter with a near flawless finish. Rose quartz is known as the Lover's Stone, it is used as a Feng Shui cure to radiate soothing love energies in the home or office. The oriental stand is sold separately, click here for stands menu.